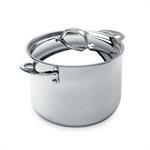 Turn your saucepan into a double boiler. 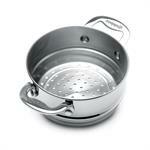 Set on top of your saucepan to steam vegetables. Never worry about damaging your fine table top again by placing a hot pot directly onto it. 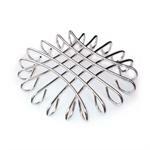 The intriguing design of this sturdy 10" wire trivet can provide a safe surface big enough to hold a casserole dish or pot of hot soup. 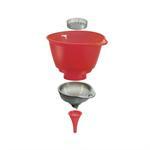 For small to large tasks, this 4 piece set includes large canning funnel with removable strainer, medium funnel with unique spout designed for filling pepper mills, and a small funnel for narrow necked bottles. Make an endless combination of mini ice cream sandwich treats in three different shapes. Cuisipro's mini ice cream sandwich maker uses one tool to effortlessly cut top cookie, scoop ice cream, cut bottom cookie, and press out your frozen treat. There is no need to use a separate lifter with this removable rack - large handles allow for easy lifting with oven mitts. 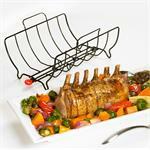 The non-stick lifter features a removable pin for disassembling rack from under meat once it is placed on a platter. 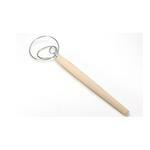 Balloon whisks are available in two sizes and work best with light batters. 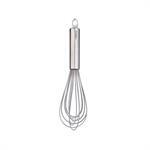 Cuisipro whisks have durable sturdy stainless-steel wires with silicone coating. 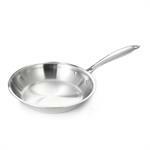 Silicone is heat resistant to 575°F(300°C) and won't scratch your non-stick cookware. 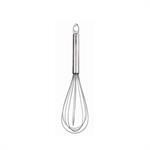 Cuisipro whisks have durable sturdy stainless-steel wires with silicone coating. 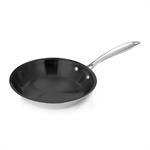 Silicone coated stainless steel wires are heat resistant to 575°F (300°C) & won't scratch your non-stick cookware. Egg whisks can be used for stirring, mixing, and blending. With durable sturdy stainless-steel wires with silicone coating these flat whisks are heat resistant to 575°F and won't scratch your non-stick cookware. 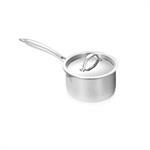 Use the flat whisks for smooth sauces and gravy when cooking in flat pans. 5 piece standard set includes: 1/8 tsp (0.625ml), 1/4 tsp (1.25ml), 1/2 tsp (2.5ml), 1 tsp(5ml), 1 Tbsp (15ml). 5 piece odd set includes: pinch(0.312ml), 1/8 tsp (0.625ml), 2/3 tsp (3.3ml), 1 1/2 tsp (7.5ml), 2 tsp (10ml). 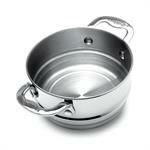 Dishwasher safe stainless steel. 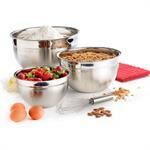 Set of 3 stainless steel mixing bowls have clearly marked measurements make adding ingredients simple and accurate. 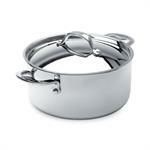 The wide rim makes them easy to hold, mix and pour, these are the bowls you will reach for time and again! 1.5qt, 3qt. and 4qt capacity. 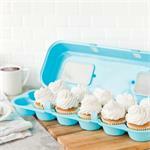 This fun, yet practical Cupcake Carton resembles an egg carton but instead of eggs it holds a dozen cupcakes (or muffins) to take to work, school, or potlucks. 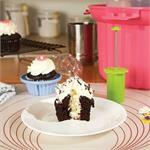 The Cupcake Corer removes the core from cupcakes and fill with icing, ice cream, fruit or any filling of your choice. This is an easy way to add something extra to your cupcakes. 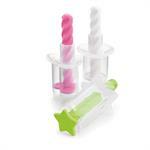 Cupcake Dividers allow you to separate your cupcakes into 2 or 4 parts for endless options of colours & flavours. 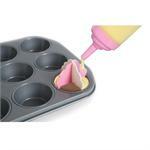 Simply place the dividers in your cupcake tin, add your batters, remove the dividers & bake! Perfect special occasions, holidays, school etc. The strong wires are attached to a 7.5" sturdy handle, giving lots of leverage for working heavy batter. 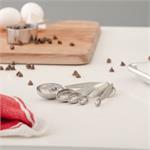 No other whisk, spoon or hand tool does such a thorough and efficient job of stirring, mixing, and blending. 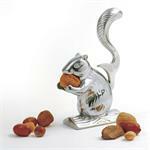 Easily crack your favourite nuts with the Davy Crack'it Squirrel Nutcracker. To use, lift Davy's tail, place the nut in his mouth and press down on his tail to crack. Nutcracker is ideal for almonds and pecans, and is fun for the whole family. 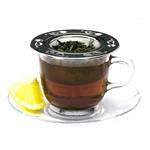 Laser cut perforations are superior for small leaves and fine cut teas. Try making your own tea blend from dried herbs and edible flowers. 3.75" diameter fits on the rim of a cup or teapot. Place this stainless steel mesh strainer on top of your tea cup or mug to hold your loose tea leaves while your tea is brewing. 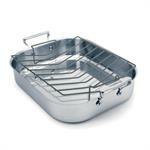 The heavy-duty, cast aluminum construction of the Deluxe Bean Frencher with stainless steel blades speeds up prep time. 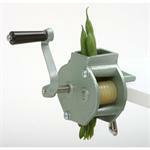 Clamp frencher onto stable surface, and feed fresh green beans into hopper. beans will be sliced into slender, french cut slices. 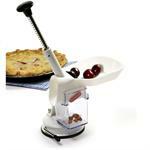 The deluxe cherry pitter features an automatic feed tray, a sturdy spring-loaded plunger, and a seed catch hopper. Load cherries into feed tray, and use plunger to remove seed as they roll through plunger hole one after another. 11" white porcelain platter holds 12 deviled eggs. 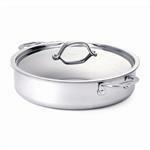 Oven, microwave, and dishwasher safe. A new species of dinosaur has just been discovered! The Cupcakeosaurus! 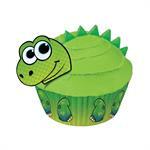 This kit decorates 24 dinosaur cupcakes and includes 24 liners, 24 dinosaur head picks and 'spike' sprinkles. 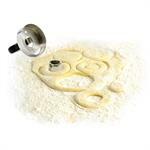 This dual stainless steel cutter makes 3" donut and donut holes in one press, as well as works great for making mini bagels. 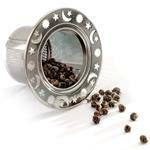 It features an easy snap in/out removable centre. Remove the centre to cut cookies, biscuits, tarts, bread, and jello. ©2019Country Lane Kitchens, All Rights Reserved.